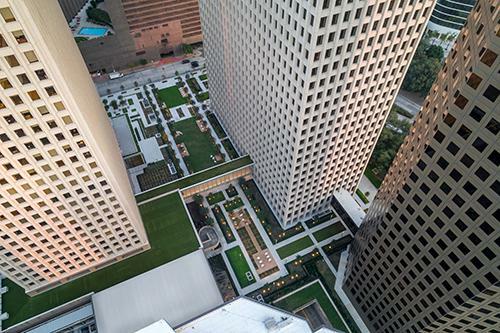 Office buildings and The Acre green space along Smith Street in downtown Houston. HOUSTON – (Realty News Report) – With the start of April, construction fencing is going back up at Allen Center as the second phase of redevelopment by owner Brookfield Properties kicks off, this time affecting Two and Three Allen Center. The project, part of the multi-phased “Reimaging Allen Center,” has a late 2020 completion date. Travis Overall, executive vice president and head of the Texas Region for Brookfield, has characterized the overall project’s underlying approach as “holistic.” The scope brings improvements at the street level, more open areas inside and out, more natural light in lobby areas, and more retail opportunities. Phase I of the reimagined campus, was completed in 2017 and affected One Allen Center, last tweaked in 1992. The 34-floor story building with 1 million SF office space added a two-story glass façade, a re-clad sky bridge connecting to Two Allen Center, and The Acre, a greenspace for gathering, programming and street-level connection. And, importantly, Brookfield ripped out a skybridge and a berm that served as a barrier blocking humans from Smith Street. Phase II continues that evolution toward a more vibrant environment relevant to today’s tenant expectations and the evolution of the office experience, project materials say. Two Allen Center’s redesign adds a two-story lobby, a terrace on the second floor that looks over the Acre, and updated retail bays – including a “glass-box” restaurant expected to open this fall. The 36-story tower has 1 million SF office space. Three Allen Center, meanwhile, gains a renovated lobby plus a new facility with showers and lockers. The 1980-built 50-story tower has 1.2 million SF office space. As part of Phase II, a new sky bridge will connect the two towers, which also get their elevator lobbies updated. The Phase II development team includes architects Morrison Dilworth + Walls and PDR Corp., with construction contractor Tellepsen and with OJB Landscape Architecture, which also designed The Acre during the project’s initial phase. Brookfield is not disclosing the project value for Phase II, though the first phase cost $48.5 million. Elsewhere on campus, the former DoubleTree Hotel by Hilton is being overhauled, updated and rebranded as the C. Baldwin. The hotel’s ongoing renovation includes redesigned guestrooms and common areas, a restaurant, greenspace and 14,000 SF of space for meetings and events. The repositioned property has its relaunch this summer. As rebranded, the name has hyper-local relevance as it honors Charlotte Baldwin Allen. She’s considered the Mother of Houston since her dowry is what bankrolled the city’s founding by her husband and his brother, aka the Allen Brothers. By any name, the hotel is part of Allen Center, which occupies a seven-acre site on the west side of downtown. Earlier this year, Brookfield also commenced work on transforming another of its super-sized energy era properties, Houston Center on the east side of downtown. That project also animates a mega-scale mixed-use complex by adding light, opened up spaces, and amenities at street level for those who work and pass by.